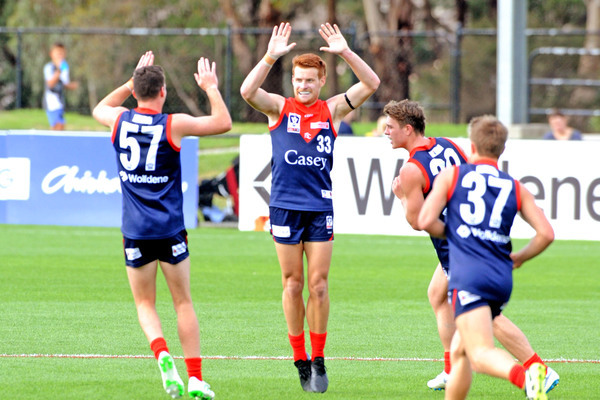 After a poor Round 1 performance against Box Hill, the Casey Demons responded emphatically on Saturday afternoon, demolishing North Melbourne by 54 points at Casey Fields. 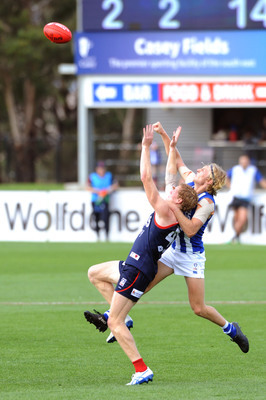 The win was set up by a dominant first quarter as the Demons slammed on six goals and kept the Kangaroos scoreless. Tim Smith booted the first two goals of the game, before Jeff Garlett soccered through another to have Casey leading 3.3 (21) to 0.0 (0) halfway through the quarter. With Garlett applying intense pressure in the forward half, the Kangaroos were turning the ball over and the Casey forwards feasted on those mistakes. The second quarter was more of the same as Casey continued to put goals on the scoreboard and after Oskar Baker slotted the last two majors of the half, Casey entered the main break with a massive lead, 10.9 (69) to 2.3 (15). Clearly not content, the Demons were even more dangerous around goal in the third term as they put the contest to bed with a seven-goal to two quarter. The likes of Garlett, Baker, skipper Mitch White and Jaxon Briggs were impressive in the forward fifty as the Kangaroos defence just couldn’t contain the direct and free-flowing entries that were coming in thick and fast. With a quarter to play, Casey held an 83-point lead, 17.10 (112) to 4.5 (29). While the forward line was operating superbly, the work down back from Harrison Petty and Declan Keilty was just as important, ensuring North Melbourne’s forwards were never able to get into the game. With the game all but over, Casey took the foot off the gas in the final term and North Melbourne was able to put some respectability on the scoreboard. A six-goal to one term for the Kangaroos saw the Demons run out 54-point winners, 18.11 (119) to 10.5 (65). Despite North Melbourne trimming the deficit significantly in the final term, it was a commanding response from Casey as they re-discovered their pressure and defensive tenacity that led them to last year’s grand final. There’s no doubt that when the Demons are able to play their brand of footy, they are an incredibly tough team to beat and this performance should be the benchmark going forward. It was a strong team performance from the Demons, with an array of terrific players across the ground. The forward line was led by Jeff Garlett (18 disposals and three goals), who was involved in everything, along with Mitch White and Jaxon Briggs (three goals each). Harrison Petty, Mitch Gent (21 disposals) and Declan Keilty were also impressive as the Demons bounced back from a 62-point defeat at the hands of the Hawks last week. For North Melbourne, Tom Campbell, Kyron Hayden and Nicholas Rippon were best in a tough day at the office. Casey has a bye in Round 3 and will return to action in Round 4 in what should be a great contest when they take on Richmond at Casey Fields from 2pm on Saturday, 27 April.